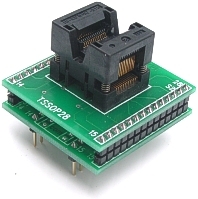 This adapter is a generic TSSOP28 to DIP adapter. It can be be used on any programmer for all TSSOP28/TSOP28 conversion. It is 1:1 pin mapping from PLCC to DIP. TSSOP-28 (0.65 mm pin pitch) to DIP-28 (600 mil body width, 0.1" pin pitch) surface mount adapter.